Report on the 23rd annual Passport to Cabernet, presented by the California Cabernet Society, on the afternoon of Monday, May 6th 2013, at Bently Reserve in San Francisco. The event showcases current releases of Cabernet Sauvignon from member wineries as well as barrel samples from the most recent vintage, in this case 2012. The California Cabernet Society was founded in 1991, and the organization’s stated mission is “expanding worldwide regard and appreciation for California Cabernet Sauvignon.” There are currently over 80 winery members from a number of California wine regions, though most hail from Napa Valley. 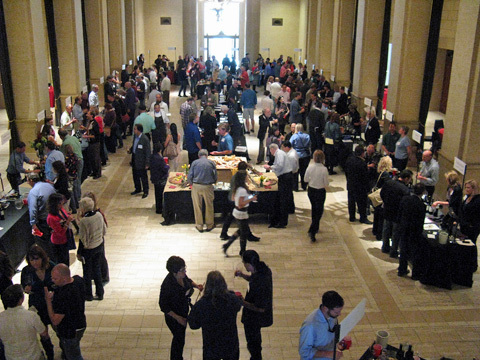 The Society’s annual spring tasting event held in San Francisco includes the largest organized public tasting of Cabernet Sauvignon barrel samples from the previous year’s vintage. This was my first time attending the Passport to Cabernet tasting. There were 32 wineries listed as pouring at this year’s event, although I didn’t spot tables for a few of them at the tasting so I’m not sure that all of the listed participants were there. Most producers were from Napa Valley (20 of the 28 tables I visited), though others at the event represented various parts of Sonoma as well as Paso Robles, Santa Barbara, and Temecula. There was a good mix of wineries, with a number of notable high-end Cab producers on hand, affording a rare opportunity to taste some of their wines. The venue for the tasting, Bently Reserve in San Francisco’s Financial District, was home to the old Federal Reserve Bank of San Francisco until 1983. It’s a beautiful space with a tall ceiling and neoclassical architecture, a fine choice for the event. There was plenty of room for all the winery tables arranged around the sides of the large central hall, with tables in the middle of the space for food and to display wines that were part of the day’s silent auction. There was a two-hour trade / media portion of the tasting followed by two hours of public tasting, and I was able to arrive in time to taste throughout the afternoon. There were quite a few people at the trade / media tasting, though I didn’t notice as big an increase in attendees once the public portion started as I do at many wine tastings. There was plenty of very good bread and cheese, provided by Chef Richard Haake & Winery Chefs Catering. From start to finish, I thought the event was very well-run. I tasted wines from 28 producers at the Passport to Cabernet event. One winery participant had poured out of their wine and left early – Briar Rose, from Temecula. I thought that was a bit curious, since as far as I could tell, everyone else stayed to the end of the event, including many more highly-regarded producers. I let the pourers at each winery table recommend the order in which to taste their wines – some started with a current release wine while others started with their barrel sample. I didn’t feel it was too distracting to go back and forth from one to the other as I went through the tables. Most current-release wines were from the 2008 to 2010 vintages, though there were a handful of older ones as well. All of the barrel samples I tasted were from the 2012 vintage except one from 2011. A couple of tables I visited toward the end of the tasting had already run out of their barrel samples though they still had current releases to pour. I’ve tried as much as possible to indicate in my notes whether wines I tasted were 100% Cabernet Sauvignon or blends, and what the varietal make-up of the blends were. Most of the current-release wines poured at the event were blends rather than 100% Cabernet Sauvignon – and there was one Cabernet Franc that was poured as well. Some of the barrel samples poured at the tasting had already been blended but many had not been and these represented single-barrel components that will go into a final blend. 2012 vintage impressions from the California Cabernet Society mentioned that the year was basically back to normal after the particularly cool and low-yielding 2011 vintage. They noted that the weather in most Cabernet-growing regions was warm but mild, without notable heat spikes during the growing season or rain during harvest. The organization feels that the outlook is for very good quality as well as increased quantity of wine from 2012. Overall favorite wineries at Passport to Cabernet included Cain, Cornerstone, Faust, Robert Keenan, and Stone Edge, while Ackerman, Bell, Guilliams, Mario Bazán, Star Lane, Viader, and Volker Eisele were among others who presented strong line-ups as well. Most of my favorite current-release wines came from the 2008 and 2009 vintages, and eight of the ten were blends rather than 100% Cabernet Sauvignon (though a few of the blends featured 90%+ Cabernet Sauvignon). I looked for other trends among my favorites in terms of vintage or region (several were from the Spring Mountain and Coombsville areas), but I realized that it was more a matter of winemaking style than anything else that differentiated most the wines poured at this event. I tend to prefer Cabernets and other Bordeaux-variety reds with a touch of the herbal character that I feel define them, so more of my favorites were wines that displayed that. But obviously that’s not everyone’s preference, and hopefully the tasting notes will help serve as a guide to wines that will be enjoyable but made in other styles. For the 2012 barrel samples, I found it tough to form a solid impression of such young Cabernets, most of which still clearly needed lots of barrel age to evolve into anything close to their final forms. That said, some were clearly more developed than others and I tended to rate those a bit higher, if only because it was easier for me to imagine where they might be headed in the long run. I found there was less correlation than I would have expected between producers’ current releases and their barrel samples – in a number of cases I clearly preferred one or the other, though of course there were some producers I thought had strong showings for both. Passport to Cabernet was a fun event for me. I’ve spent more time over the years tasting Pinot Noirs, Rhône-variety wines, and others, and I haven’t concentrated nearly as much on Cabernet Sauvignon, which is, after all, California’s most celebrated wine throughout the world. The overall quality of the wines was high, and the range of producers allowed one to taste wines from a number of different areas and made in different styles. Passport to Cabernet is a nicely-focused event, and it presents a great opportunity to spend the afternoon sampling some fine California Cabernet Sauvignons. Ackerman 2008 Cabernet Sauvignon, Napa Valley. 100% Cabernet Sauvignon. Medium-dark color, this featured dried herb/tobacco, currant, earth, and spice aromas. Moderately rich mouthfeel with good structure and a long finish with chalky tannins, nice. Ackerman 2005 Cabernet Sauvignon, Napa Valley. 100% Cabernet Sauvignon. Slightly darker purple color, with higher-toned fruit, earth, and leather notes plus undertones of spice and oak. Medium-bodied, this still had very grippy tannins. Ackerman 2012 Cabernet Sauvignon, Napa Valley (barrel sample). Brighter purple, more fruit-forward aromas along with spice and earth on the nose. Medium-full bodied, with a big tannic finish. Comments: Fruit comes from certified organic vineyards in the recently-designated Coombsville AVA of Napa Valley. Adelaida 2012 Cabernet Sauvignon, Viking Vineyard, Paso Robles (barrel sample). Medium-dark color, with bright and ripe black cherry and plum fruit, along with spice and a touch of oak. Fairly rich mouthfeel with moderately big tannins. Adelaida 2009 Cabernet Sauvignon, Viking Vineyard, Paso Robles. Slightly darker color, this displayed similar bright fruit aromas, plus spice, an herbal note, and vanilla/oak. Somewhat leaner on the palate than the barrel sample, with a grippy tannic finish. Bell 2009 Claret, Napa Valley. 80% Cabernet Sauvignon, 11% Merlot, 6% Syrah, 2% Cabernet Franc, 1% Malbec. Medium-dark color, with plenty of black cherry and plum fruit, plus tobacco, earth, and green olives on the nose, along with undertones of sweet oak. Medium-full bodied, with big but refined tannins and a long finish, very nice. Bell 2010 Cabernet Sauvignon, “Clone 6,” Rutherford, Napa Valley. 100% Cabernet Sauvignon Clone 6, from Georges III Vineyard. Darker color, with darker fruit tones and more earth and spice character than the Claret. Rich mouthfeel with chewy tannins and a long finish. Bell 2012 Cabernet Sauvignon, “Clone 6,” Rutherford, Napa Valley (barrel sample). 100% Cabernet Sauvignon Clone 6, from Georges III Vineyard. Medium-dark purple, featuring brighter fruit notes along with spice and a touch of green pepper in the background. Fairly lively on the palate and finishing with lots of youthful tannins. Comments: An interesting comparison between the Claret blend and the 100% Cabernet – I preferred the Claret but both were nice and very different from each other. Blue Rock 2012 Cabernet Sauvignon, “Best Barrels,” Estate, Alexander Valley (barrel sample). Medium-dark color, with bright and primary fruit plus dried herb/tobacco and undertones of vanilla/oak. Medium-rich in the mouth with big but not aggressive tannins. Blue Rock 2009 Cabernet Sauvignon, “Best Barrels,” Estate, Alexander Valley. 85% Cabernet Sauvignon, 15% Petit Verdot. Medium-dark purple, this also displayed bright plum and currant fruit, but with less herbal notes and more noticeable oak and chocolate. Rich but lively texture on the palate with refined tannins. Cain 2012 “Cain Concept – The Benchland,” Napa Valley (barrel sample). 85% Cabernet Sauvignon, 8% Merlot, 4% Cabernet Franc, 3% Petit Verdot. Medium-dark, with upfront fruit along with a dark, dusty component. Bold mouthfeel with big, chalky tannins on the finish. Cain 2012 “Cain Five,” Spring Mountain District, Napa Valley (barrel sample). 49% Cabernet Sauvignon, 22% Merlot, 12% Cabernet Franc, 12% Petit Verdot, 5% Malbec. Slightly darker color, this showed more herbal and green olive notes along with spice and earth, not as fruit-forward as the “Concept” bottling. Finer texture and tannins point toward this becoming a more elegant wine. Cain 2008 “Cain Concept – The Benchland,” Napa Valley. 48% Cabernet Sauvignon, 25% Merlot, 18% Cabernet Franc, 9% Petit Verdot. Medium-dark purple, featuring dark berry and currant fruit, tobacco/herbs, and spice. Big and rich in the mouth with chewy tannins. 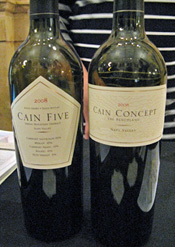 Cain 2008 “Cain Five,” Spring Mountain District, Napa Valley. 61% Cabernet Sauvignon, 15% Merlot, 13% Cabernet Franc, 6% Malbec, 5% Petit Verdot. Medium-dark color, aromas of plum and currant, earth, spice, and a stony mineral note. Fairly rich but refined on the palate, with the structure for aging and fine tannins on the long finish, nice. Comments: Strong showing for the Cain wines, and the distinctions between the bolder valley floor “Cain Concept” and more complex (to me) mountainside “Cain Five” were very apparent. Charles Krug 2010 “Generations,” Estate, Napa Valley. 77% Cabernet Sauvignon, 13% Merlot, 8% Petit Verdot, 2% Cabernet Franc. Medium-dark color, with ripe, upfront currant and darker berry fruit, with big spice and vanilla/oak components, and a touch of dried herbs on the nose. Fairly rich mouthfeel with moderate tannins. Charles Krug 2010 Cabernet Sauvignon, “Vintage Selection,” Estate, Napa Valley. 97% Cabernet Sauvignon, 2% Cabernet Franc, 1% Merlot. Darker purple color, this had a better-integrated oak element and more depth to the fruit, along with notes of spice and chocolate. More textured on the palate with grippy tannins on the finish. Charles Krug 2012 Cabernet Sauvignon, Estate, Napa Valley (component barrel sample). 98% Cabernet Sauvignon, 2% Petit Verdot. Dark color, this had lots of primary fruit plus earth and spice notes. Rich but lively in the mouth with chewy tannins. Stepping Stone 2010 Cabernet Sauvignon, Napa Valley. 93% Cabernet Sauvignon, 7% Merlot. Medium-dark color, featuring bright plum and currant aromas, spice, and background notes of herbs and sweet oak. Medium-bodied and lively with moderate tannins – nice Cab in an earlier-drinking style. Cornerstone 2009 Cabernet Sauvignon, Napa Valley. Sourced from three vineyards, 95% Cabernet Sauvignon, 5% Merlot. Medium-dark purple, this showed deeper fruit character along with a bigger oak component, chocolate, and spice. Bolder mouthfeel with a grippier tannic finish. 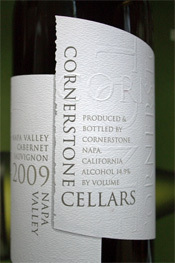 Cornerstone 2009 Cabernet Sauvignon, Howell Mountain, Napa Valley. 95% Cabernet Sauvignon, 5% Merlot. More vibrant purple color and more intense aromas than the previous wine, with currant and vanilla/oak leading the way. More structured on the palate with big, chewy tannins that will need time to resolve. Cornerstone 2009 “The Cornerstone,” Napa Valley. 95% Cabernet Sauvignon, 2.5% Merlot, 2.5% Cabernet Franc. Medium-dark color, this displayed the most complex aromatics of the Cornerstone wines, with black cherry and plum, tobacco, dark chocolate, and a stony mineral note. Lively mouthfeel and great balance and structure, with refined tannins on the long finish, very nice. Cornerstone 2012 Cabernet Sauvignon, Napa Valley (barrel sample). Medium-dark color, showing primary dark berry fruit, herbs, and sweet oak on the nose. Fairly big and dense, with moderate tannins. Comments: Very good group of wines from Cornerstone. The Stepping Stone Cabernet deserves special mention as it’s a great value for a Napa Valley Cab of its quality. Diamond Creek 2010 Cabernet Sauvignon, “Volcanic Hill,” Diamond Mountain District, Napa Valley. About 88% Cabernet Sauvignon. Medium-dark purple, showing earth, leather, and spice on the nose along with dark fruit and undertones of vanilla/oak. Medium weight on the palate with moderate tannins. Diamond Creek 2012 Cabernet Sauvignon, “Volcanic Hill,” Diamond Mountain District, Napa Valley (barrel sample). Vibrant dark purple, more fruit-forward than the 2010 bottling but with similar earth and spice character plus currant and darker berry fruit. Brighter on the palate with a grippier tannic finish. Comments: Very consistent and distinctive character between the bottled wine and barrel sample, perhaps the most of any producer at the event. 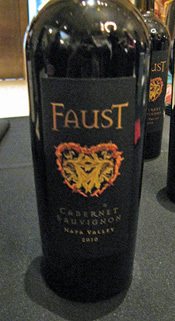 Faust 2010 Cabernet Sauvignon, Napa Valley. 83% Cabernet Sauvignon, 13% Merlot, 3% Malbec, 1% Cabernet Franc. Medium-dark color, this had a dark fruit profile along with tobacco, spice, and a minerally note, with very well-integrated oak. Medium-full bodied with good structure, refined tannins, and a lengthy finish, very nice. Faust 2012 Cabernet Sauvignon, Napa Valley (barrel sample). Already a blend of other varieties with Cabernet. Dark color, with dark berry fruit, herbs, and a touch of sweet oak. Medium weight with moderate tannins, shows potential. Comments: Fruit is sourced from the estate vineyard in the Coombsville area, plus from vineyards in the Rutherford and Atlas Creek areas. Both the current release and barrel sample were standouts. Guilliams 2007 Cabernet Sauvignon, Spring Mountain District, Napa Valley. 92% Cabernet Sauvignon, 6% Cabernet Franc, 2% Merlot. Medium-dark purple color, with bright fruit, earth, dried herb, and mineral aromas. Lively texture with good structure and medium-big tannins, nice. Guilliams 2009 Cabernet Sauvignon, “Reserve,” Spring Mountain District, Napa Valley. 94% Cabernet Sauvignon, 6% Cabernet Franc. Slightly darker color, with riper fruit, more spice, and a more noticeable oak component on the nose. Richer mouthfeel with a grippier tannic finish. Guilliams 2012 Cabernet Sauvignon, Spring Mountain District, Napa Valley (barrel sample). Medium-dark color, with currant and plum fruit, spice, and earth notes. Medium-bodied with moderate tannins, one of more developed 2012 barrel samples. Comments: Fruit is sourced entirely from the estate vineyard. This was a strong line-up of wines. Hagafen 2010 Cabernet Sauvignon, Estate, Napa Valley. Mostly Cabernet Sauvignon with a little Merlot, Cabernet Franc, and Petit Verdot. Medium-dark purple, this was earthy and spicy, with the plum and black cherry fruit in a supporting role. Medium weight on the palate, with fairly chewy tannins. Prix 2007 Cabernet Sauvignon, Estate, Weir Family Vineyards – MJT Block, Napa Valley. Mostly Cabernet Sauvignon with a little Merlot and Cabernet Franc. Medium-dark color, with riper, higher-toned upfront fruit, a bigger vanilla/oak component, and spice on the nose. More full-bodied, with more refined tannins on the finish. Jordan 2009 Cabernet Sauvignon, Alexander Valley. 75% Cabernet Sauvignon, 19% Merlot, 5% Petit Verdot, 1% Malbec. Medium-dark color, with currant, chocolate, and spice aromas. Fairly rich mouthfeel and moderately grippy finish. Jordan 2012 Cabernet Sauvignon, Alexander Valley (barrel sample). More fruit-forward, with plum and black cherry notes. Lighter texture on the palate and medium tannins, a tasty component. Kenefick Ranch 2008 Cabernet Sauvignon, “Chris’s Cuvée,” Napa Valley. 83% Cabernet Sauvignon, 12.5% Merlot, 4.5% Petit Verdot. Dark color, this featured dark fruit, loads of spice, and chocolate aromas. Big and rich on the palate, with moderate tannins. Kenefick Ranch 2008 Cabernet Franc, “Caitlin’s Select,” Napa Valley. 85% Cabernet Franc, 10% Cabernet Sauvignon, 5% Merlot. Medium-dark color, showing the more herbal dark berry character of Cab Franc along with spice, mocha, and sweet oak notes. Full-bodied with grippier tannins on the finish. Kenefick Ranch 2012 Cabernet Sauvignon, Napa Valley (barrel sample). 100% Cabernet Sauvignon. Dark color, with more dried herb/tobacco along with dark berry fruit, some earthy notes, and less overt oak influence. Brighter mouthfeel and moderate tannins on the lively finish. Comments: Fruit comes from the estate vineyard near Calistoga. Linked 2012 Cabernet Sauvignon, Knights Valley (barrel sample). 100% Cabernet Sauvignon. Dark purple, with ripe dark berry fruit and chocolate aromas. Lush texture in the mouth, with moderately big tannins. Linked 2008 Cabernet Sauvignon, Knights Valley. 100% Cabernet Sauvignon 337 clone. Medium-dark color, with bright currant and darker fruits, spice, and a mineral note. Fairly lively on the palate, this wine would have been attractive except for an unpleasantly smoky finish that could be a legacy of its vintage. Martini 2010 Cabernet Sauvignon, Napa Valley. 100% Cabernet Sauvignon. Medium-dark color, featuring loads of spice on the nose with plummy fruit and a dash of oak in the background. Medium-full bodied, this had moderate tannins. Martini 2010 Cabernet Sauvignon, Alexander Valley. 100% Cabernet Sauvignon. Medium-dark purple, more fruit-forward than the previous wine, and showing tobacco and black pepper notes. Fairly rich mouthfeel with a big chewy tannic finish. Martini 2008 Cabernet Sauvignon, Monte Rosso Vineyard, Sonoma Valley. 100% Cabernet Sauvignon. Slightly lighter color, this displayed more depth to the currant and plum fruit, as well as more evident oak spice and chocolate aromas. Rich and full-bodied with finer tannins on the finish. Martini 2012 Cabernet Sauvignon, Monte Rosso Vineyard, Sonoma Valley (barrel sample). 100% Cabernet Sauvignon. Medium-dark color, this showed a darker fruit profile and some herb and oak on the nose. Moderately rich with medium tannins. 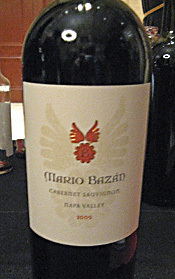 Mario Bazán 2009 Cabernet Sauvignon, Napa Valley. 100% Cabernet Sauvignon. Medium-dark color, with herb/tobacco, currant, spice, and sweet oak aromas. Medium-full bodied and nicely-balanced, finishing with moderate tannins, nice. Mario Bazán 2012 Cabernet Sauvignon, Napa Valley (barrel sample). 100% Cabernet Sauvignon. Dark color, more primary dark fruit with some herb and mineral notes. Rich but lively texture with a grippy tannic finish. Comments: Good showing for both of these wines. Peju 2012 Cabernet Sauvignon, Napa Valley (barrel sample). 100% Cabernet Sauvignon. Medium-dark purple, with dried herbs, currant, and plum on the nose. Fairly full-bodied with big but refined tannins. Peju 2010 Cabernet Sauvignon, Napa Valley. 90% Cabernet Sauvignon, 10% Petit Verdot. Medium-dark color, this had lots of upfront spice aromas, plummy fruit, and smoky oak. Mouth-coating texture with a firmly tannic finish. Keenan 2009 Cabernet Sauvignon, Napa Valley. Sourced from 73% estate fruit, 100% Cabernet Sauvignon. Dark color, with dark berry fruit, spice, and a mineral note. Medium-rich mouthfeel with chalky tannins on the finish. Keenan 2009 Cabernet Sauvignon, “Reserve,” Spring Mountain District, Napa Valley. Entirely estate fruit, 95% Cabernet Sauvignon, 5% Cabernet Franc. Dark purple, this had a similar dark fruit profile to the previous wine, and also displayed more dried herb/tobacco and sweet oak as well as a more pronounced stony mineral component. Rich texture on the palate with good structure and a long tannic finish, nice. 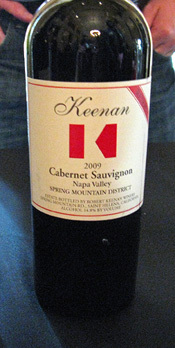 Keenan 2012 Cabernet Sauvignon, Spring Mountain District, Napa Valley (barrel sample). Entirely estate fruit, 90% Cabernet Sauvignon, 5% Cabernet Franc, 5% Merlot. Dark color, this displayed herbs and black cherry on the nose. Medium-full bodied with grippy tannins, this was one of the more developed barrel samples poured at the event. Comments: Both of the Keenan 2009 Cabs were quite nice, but the “Reserve” was a step above the regular bottling. Overall a very good showing for these wines. Rocca 2009 Cabernet Sauvignon, Grigsby Vineyard, Yountville, Napa Valley. 90% Cabernet Sauvignon, 10% Merlot. Medium-dark color, with bright aromas of dark berry fruit, some herb notes, and vanilla/oak. Medium-bodied with good acidity and moderate tannins. Rocca 2009 Cabernet Sauvignon, Collinetta Vineyard, Coombsville, Napa Valley. 100% Cabernet Sauvignon. Slightly darker purple, featuring a bigger spice and oak component along with currant and darker fruit. Lively texture in the mouth with medium tannins on the finish. Rocca 2012 Cabernet Sauvignon, Grigsby Vineyard, Yountville, Napa Valley (barrel sample). 100% Cabernet Sauvignon. Medium-dark color, this had upfront currant fruit plus a big wood/toasty oak component on the nose. Richer mouthfeel with a grippy tannic finish. Sebastiani 2010 Cabernet Sauvignon, Alexander Valley. 88% Cabernet Sauvignon, 6.5% Merlot, 5.5% Petit Verdot. Medium-dark color, lots of spice, vanilla/oak, and chocolate along with dark fruit. Medium-rich on the palate with moderate tannins. Sebastiani 2010 Cabernet Sauvignon, “Cherryblock,” Sonoma Valley. 88% Cabernet Sauvignon, 6% Merlot, 6% Malbec. Medium-dark purple, this showed more earth/leather notes along with plum and spice. Medium weight in the mouth with a big, grippy tannic finish. Sebastiani 2012 Cabernet Sauvignon, “Cherryblock,” Sonoma Valley (barrel sample). Medium-dark, with more focused tobacco/herb aromas plus currant and darker berry fruit. Fairly rich mouthfeel with chewy tannins. Star Lane 2008 Cabernet Sauvignon, Happy Canyon of Santa Barbara. 77% Cabernet Sauvignon, 23% Cabernet Franc. Medium-dark purple, this displayed plummy fruit, spice, and earth aromas, with vanilla/oak undertones. Big and bold on the palate with chewy tannins. Star Lane 2007 “Astral,” Happy Canyon of Santa Barbara. 49% Cabernet Franc, 35% Cabernet Sauvignon, 13% Merlot, 2% Malbec, 1% Petit Verdot. Dark purple color, showing less upfront fruit and more tobacco/herb, earth, and minerally components. Brighter mouthfeel with a lively texture and refined tannins, nice. Star Lane 2011 Cabernet Sauvignon, Happy Canyon of Santa Barbara (barrel sample). 100% Cabernet Sauvignon. Vibrant dark color, this had ripe primary plum and currant fruit, along with dried herbs and earth. Moderately rich with grippy tannins. Comments: Star Lane poured the only 2011 barrel sample of the day, and it was clearly more developed than most of the 2012 barrel samples at the tasting. The “Astral” bottling was quite good. Steven Kent 2007 “Lineage,” Estate, Livermore Valley. 65% Cabernet Sauvignon, 16% Cabernet Franc, 15% Merlot, 3% Petit Verdot, 1% Malbec. Medium-dark color, with ripe plum and currant fruit, and loads of spice and vanilla/oak on the nose. Medium-full bodied with refined tannins. Steven Kent 2009 “Lineage,” Estate, Livermore Valley. 63% Cabernet Sauvignon, 27% Merlot, 5% Malbec, 3% Petit Verdot, 2% Cabernet Franc. A bit darker purple, this had better integration of the oak component along with similar fruit character and dashes of earth, dried herbs, and black pepper. Lively and well-structured in the mouth, with a fairly big tannic finish, nice. Steven Kent 2012 Cabernet Sauvignon “Clone 30, Eastern Block,” Estate, Livermore Valley (barrel sample). Medium-dark color, featuring brighter and more primary raspberry and black cherry fruit along with spice and vanilla. Rich mouthfeel and finish. Comments: Fruit is sourced from the estate Ghielmetti Vineyard. The 2009 “Lineage” was my favorite of these wines. Stone Edge Farm 2008 Cabernet Sauvignon, Sonoma Valley. 94% Cabernet Sauvignon, 6% Merlot. Dark color, with upfront dried herb/tobacco aromas plus currant, spice, and undertones of vanilla/oak. Medium-full bodied with good structure and big but refined tannins, nice. Stone Edge Farm 2012 Cabernet Sauvignon, Sonoma Valley (barrel sample). 100% Cabernet Sauvignon. Medium-dark purple, this also displayed herb/tobacco notes upfront, along with brighter fruit and spice. Big and structured, with grippy tannins. Comments: Sourced from the two organically-farmed estate vineyards, one near the foot of Sonoma Mountain and one at higher elevation in the Mayacamas Mountains. Both of these wines were quite good. Terlato 2012 Cabernet Sauvignon, Rutherford, Napa Valley (barrel sample). 100% Cabernet Sauvignon. Medium-dark color, this was fruit-forward and primary. Medium-bodied with moderate tannins. Terlato 2009 Cabernet Sauvignon, Rutherford, Napa Valley. 100% Cabernet Sauvignon. Medium-dark purple, with upfront fruit plus chocolate, spice, and oak on the nose. Fairly rich mouthfeel with a grippy tannic finish. Trinchero 2009 Cabernet Sauvignon, Mario’s Vineyard, St. Helena, Napa Valley. 100% Cabernet Sauvignon. Medium-dark color, showing bright aromas of plum and currant, spice, and vanilla/oak. Medium-bodied and lively on the palate, with moderate tannins. Trinchero 2009 Cabernet Sauvignon, Haystack Vineyard, Atlas Peak, Napa Valley. 100% Cabernet Sauvignon. Medium-dark purple, featuring plummy fruit, herbs, spicy oak, and a touch of black pepper on the nose. Richer mouthfeel with a grippier tannic finish. Viader 2008 “Viader,” Napa Valley. 69% Cabernet Sauvignon, 31% Merlot. Medium-dark color, with ripe plummy fruit and lots of vanilla/oak and mocha on the nose. Rich and creamy texture, with moderate tannins. Viader 2012 Cabernet Sauvignon, Napa Valley (barrel sample). 100% Cabernet Sauvignon from a single vineyard block. Dark color, this was more fruit-forward, showing a prominent herb/tobacco character along with spice and sweet oak. Medium-full bodied with surprisingly refined tannins, nicely-developed for such a young Cab. Volker Eisele 2008 Cabernet Sauvignon, Napa Valley. 79% Cabernet Sauvignon, 18% Merlot, 3% Cabernet Franc. Medium-dark color, displaying currant and darker berry fruit, dried herbs, spice, earth, and vanilla/oak aromas. Very good structure and a lively mouthfeel, with fairly grippy tannins on the finish, nice. Volker Eisele 2012 Cabernet Sauvignon, Napa Valley (barrel sample). 100% Cabernet Sauvignon. Medium-dark color, showing very primary fruit plus some tobacco and oak notes. Big and mouthfilling texture with chewy tannins. Comments: All the fruit comes from the organically-certified estate vineyard in Chiles Valley. ZD 2010 Cabernet Sauvignon, Napa Valley. About 92% Cabernet Sauvignon, 8% Petit Verdot. Dark color, this featured lots of upfront vanilla/oak, with plum and darker fruit playing a supporting role. Medium-full bodied with moderately grippy tannins on the finish. ZD 2009 Cabernet Sauvignon, “Reserve,” Napa Valley. 100% Cabernet Sauvignon. Darker purple color, with more dark berry fruit and spice but still a big oak component on the nose. Bolder on the palate with plenty of structure. ZD 2012 Cabernet Sauvignon, Napa Valley (barrel sample). 100% Cabernet Sauvignon. Dark color, featuring plummy fruit along with earth and spicy oak. This had a fairly lively texture, finishing with chalky tannins.